With Valentine's Day around the corner, I've been busy working on gifts for friends and teachers. I started out by making the box with the Silhouette using two different Sweet Cakes patterns - a print for the top box and a more classic dot print for the actual box. I also lined the box with a stripe pattern for some contrast. Next I filled it up with packages of Sweethearts and a gift card from our local movie theater. And now for the giveaway --- leave a comment here on my blog and then hop on over to the Doodlebug blog. 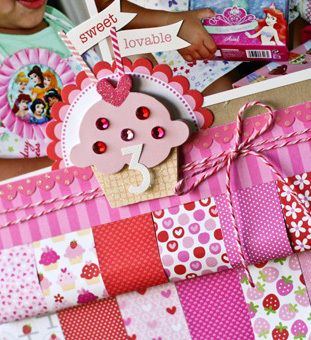 Just leave a comment there and YOU'RE ENTERED to win the entire Sweet Cakes line! 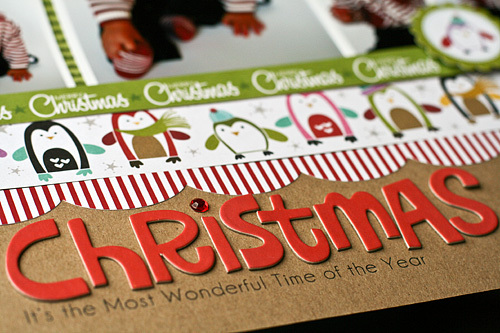 Winners will be announced on 1/31/12 on the Doodlebug blog. Good luck! Hi there and welcome to my first Gardeners' Digest post. Join me on the 22nd of every month for an update from the Garden Girls, the design team at Two Peas in a Bucket. We'll be hosting a blog hop, a give away here and there + sharing some sneak peeks. Every time I've seen this circular Silhouette pattern used, I've loved it. It's intricate, bold and interesting all at the same time. 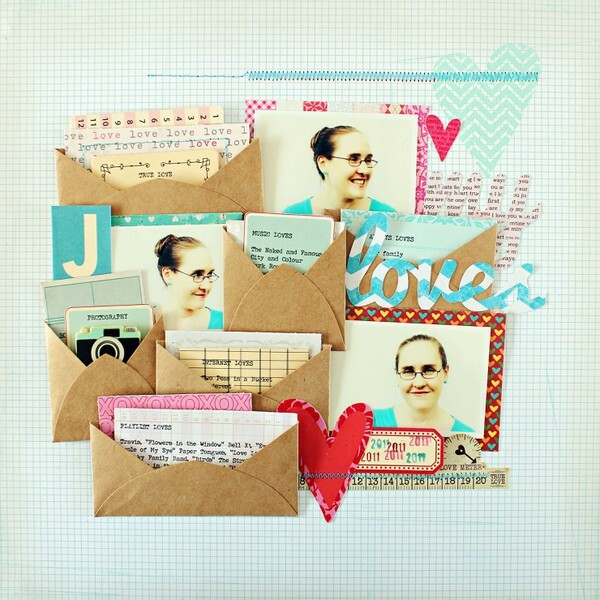 I filled it with papers from Crate's Paper Heart Collection. I love this page by fellow Garden Girl, Jill Sprott. The cluster of envelopes chock full of journaling, the tucked in title and the generally artsy, layered feel of the page inspire me. You can see more of Jill's amazing work here + the girl is witty, writes beautifully and tells an interesting story. Love that. FIVE PRODUCTS I'M USING RIGHT NOW.... All of these products match perfectly. I love when that happens! If you've made it this far, ha! - leave a comment and you'll be entered to win a $10 gift certificate to Two Peas in a Bucket.com. I'll announce a winner on 1/28/11. Good luck! Please hop on over to Shannon Tidwell's blog for another edition of the Gardener's Digest. We haven't had a flake of snow here yet - thank goodness! But I still remember last year when we had blizzards on what seemed like a weekly basis. The only good thing that came out of that frozen year, was stacks and stacks of fun snow pictures. 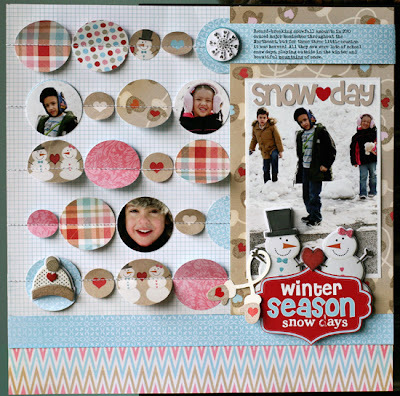 I made this layout for the Pink Paislee blog a while back using their new Snow Days line. I love how they used non-traditional winter colors and a little bit of kraft. 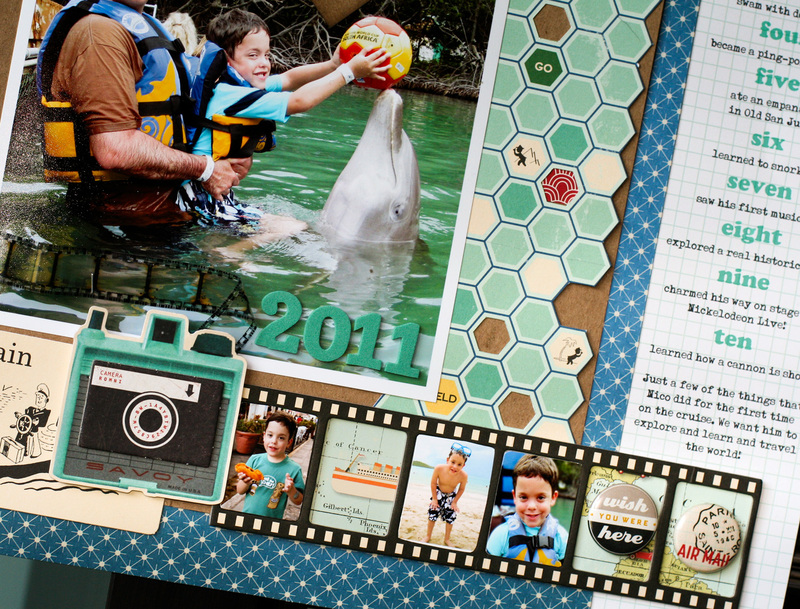 I started the page by sewing rows of punched circles and photos to the background page. By alternating the color and sizes of the circle, it added dimension to the page instead of being a static row of the same sized circles - just something different. I placed the title right on a blank spot on the photo and embellishments on the bottom. This frames out the focal point photo and adds a bright splash of red. I'm not expecting (heck no), but Bella Blvd. is! Check out their latest line at the Bella Blvd blog and leave a comment to win the collection. There are also detailed shots and sample pages. And the sneaks continue. For full images and page ideas, visit the Bella Blvd blog. And bear with me. This video thing is not easy at all. There are already so many things that I would love to go back and change on this one. But it's a learning process and I'll get there. And don't be shy about sending any constructive criticism my way. I'd love to hear your opinion and it's the only way I'll improve and get a feeling for what you want to see and not see. 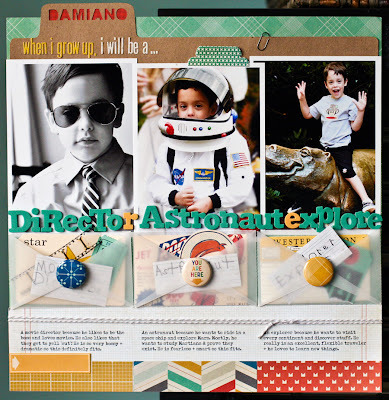 The page that I put together is about Nico and what he wants to be when he grows up. He's been saying the exact same three things for about 2 years now, so I thought it was time to get it down in the scrapbook. I think it will be interesting to see how his choices change over the years. A good friend of mine (Miss Regina) mentioned making a page like this for her own book - about what she wanted to be as a kid/teen and what she turned out to be. I think this sounds like such a fun spin on the page, I just might make another one about me. This is Bella Blvd's brand new Baby Boy line that will be debuting at the CHA Winter show very soon. I love the bright colors and cute little animals in this collection. 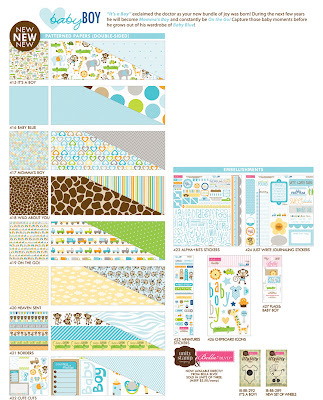 I've been working on some layouts for the Bella newsletter using this collection and I love it! For a better look at each individual pattern, you can see the full images at the Bella Blvd blog. They are doing great giveaways all week, so be sure to leave a comment for them. More sneak peeks and pages tomorrow! A new year and some great changes over in the Garden at twopeasinabucket.com! They have just announced a list of all brand-new weekly classes for 2012 and best of all - they are all FREE! Class is in session every Monday, Wednesday and Friday of the week. You can check them out here. I'm happy to announce that I'll be one of the Garden Girls teaching the Memory Keeping Mondays series. My first video will be up on Monday, January 16th and I'm equally nervous and excited to share it with you. I enjoyed the step-by-step process of showing exactly how/why I design pages the way I do, but it is not an easy task. Once you film a segment, you can't change your mind and for me that is so hard! That aside, it was worth the effort and I hope you enjoy watching it as much as I had making it. 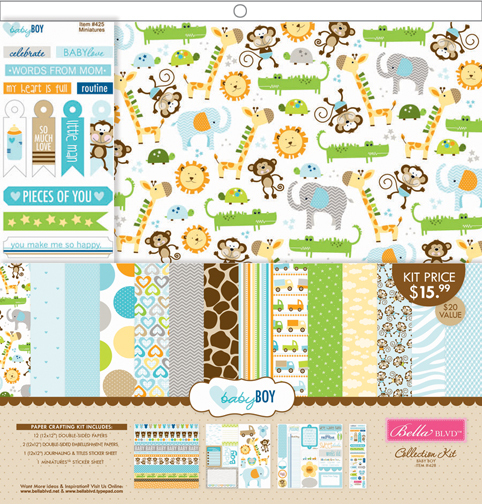 In the meantime I've got this layout that just went up at twopeasinabucket.com to share. I got the idea for this page from my travel journal. While on a cruise last year, I jotted a list of things that Nico had done for the first time on this vacation. They varied from swimming with the dolphins, to vocabulary words and even new foods that he tried. It's amazing how much children learn and absorb when they travel. And at 5, Nico is constantly questioning and learning about everything around him. We are always trying to drive the point home with him to value experiences over material things. It something that we value as a family and we hope to pass that on to Nico. I included this on the sticker at the very top of the layout to remind him. I started with the big camera sticker + filmstrip (October Afternoon) and built the rest of the page around it. The idea for the huge envelope came from wanting to stick to a "memorabilia" and "list" type theme. I added a long title (love those) and some flair pins from American Crafts to decorate the page. The list part of the layout includes all of the journaling. I didn't have matching stamps or stickers for this space so I decided to just use my computer and try to match the color and font as closely as I could. I like how it adds a pop of color to the graph paper. For a complete list of products use, click here. It's over. All the holidays are done now. I'm going to miss it - the tree, the presents, having all of the family over. Yet somehow it's always nice to go back to the routine. I've been scrapping and blogging a lot less and I'm looking forward to getting back to it. 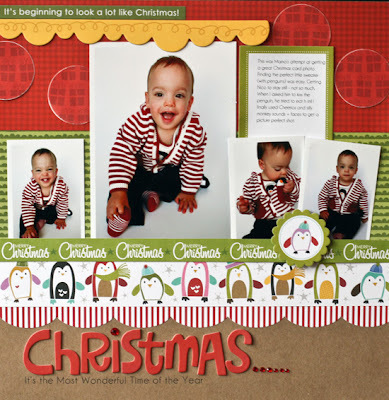 I was just putting all of my Christmas layouts away and I realized that I hadn't shared them here. First up is a sketch layout I did for the Bella Blvd blog this weekend. These pictures are from one of my attempts at a Christmas card picture years ago. No easy feat with a wiggly, 15 month old who wanted nothing more than to eat the stuffed animal in his pocket. This was back when Nico was (almost) bald and had just 4 little teeth. And as much as I love having a 6 year-old, sometimes I miss those baby days. 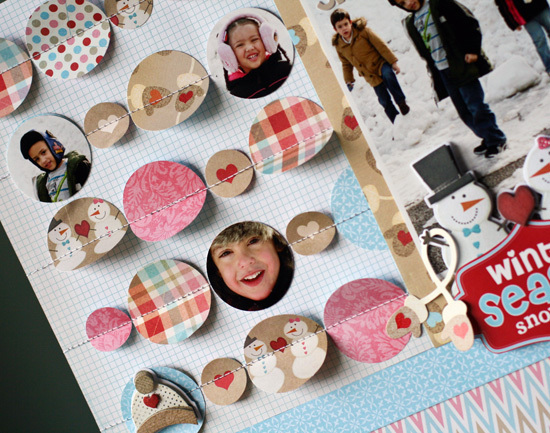 The sketch called for four photos and lots of borders - just my kind of page! I added the huge circles across the top to break up all of the solid red. 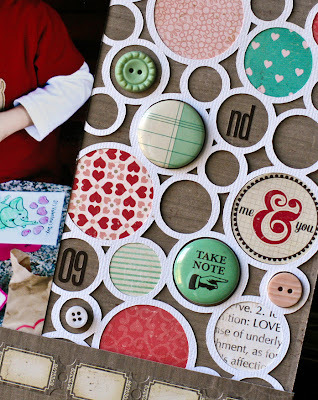 By using the larger "presents" patterned paper for the circles on top of the smaller gingham pattern, it give the design a magnifying glass effect. The title was embellished with a few jewels from Doodlebug and a line of text. I made a bunch of these little gift card bags for all of the teacher, coaches, and friend gifts we gave out this year. I cut the bags and snowflakes out with the Silhouette Cameo and embellished them with Doodlebug paper and stickers. The mini clothespins are from Maya Road. Nico and I sat down one night and cranked out 8 of these in an hour! This is a layout that I made for the twopeasinabucket.com gallery. 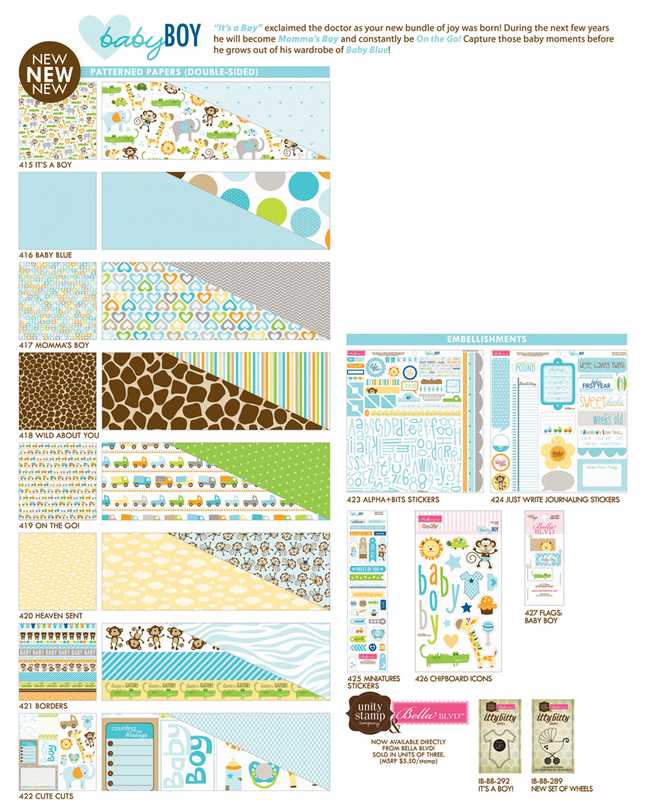 I deleted the large photo of the layout, but you can still view it in my gallery here. It's about Nico and his love of all Christmas carols. What he doesn't understand is that we are not a musical/singing type of family. And somehow we ended up with this boy who is constantly singing. I remember taking these photos years ago and when I saw that October Afternoon record, I knew exactly what I was going to do with it! And now I'm off to find a great pocket page to put all of these photo Christmas cards away! It's the very last thing I need to put away this holiday season. I hope you had yourself a Merry Little Christmas (or any other holiday you may celebrate)!